Version 1.6.1 ready for download! Version 1.6.0 ready for download! Version 1.5.0 ready for download! Version 1.4 ready for download! Version 1.3 ready for download! Version 1.2 ready for download! ManuelBastioniLAB 1.1.0 ready for download! 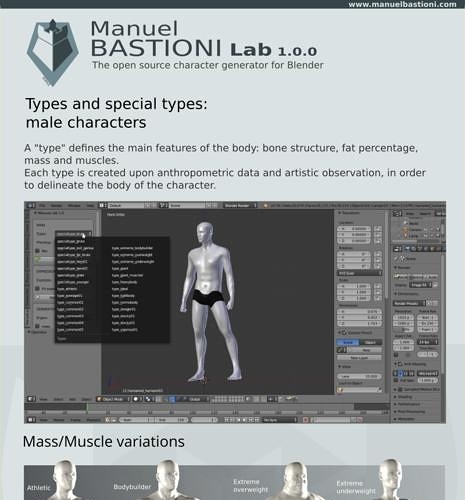 I’m proud to announce the born of my new creation: “Manuel Bastioni Lab”, a tool to turn Blender in a powerful laboratory for 3d humanoids creation. 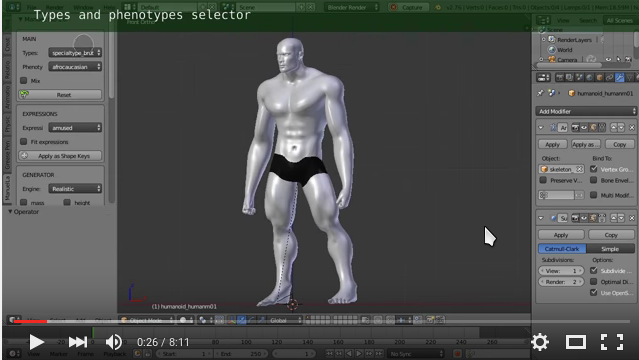 It permits to easily create rigged humans and anime models with few clicks. I wrote it upon the 15 years experience gained on CG characters projects (for example www.makehuman.org) and I’m happy to share it with you. Thanks a lot. With DAZ introducing DRM, it is high time the FOSS community stepped in on this subject. Wow this is an incredible gift! thanks for sharing with the community Manuel, this is incredibly generous! Thank you! I still have many things to add to lab…it’s not just a simple character creator, but I’m developing it with a scientific orientation (for realistic types). I’ll post a short video soon. In meantime here is an infographic about the meaning of “type” in lab. I was expecting this to be able to make aliens and monsters. I am quite perplexed by the UV layout: e.g. huge space dedicated to legs and tiny areas for eyes. Even worse a single UV layout for the whole figure (Poser/DAZ figures use at least face+head, body, arms+legs and eyes). Having a single material for the whole character does not help :(. As it is now, making good portraits is out of question. Version 1.0.0 is mainly focused on modelling features. It provides a base UV layout for general use. Materials are just place holders. Next releases will gradually add more support for materials (in particular cycles) and special UV projections. As side note, this is the result that can be obtained with a single layer (the one in MakeHuman). Fantasy support will be added just after the completion of anime database (The lab 1.0.0 supports only the female shojo type). All right, no problem and again thank you for your work :yes:. Under Manuel Lab 1.0 in Tools Panel, it is empty; no choices, (Select and Initiate) nothing. what version of blender are you using? Can you tell me the output from the dos console? Woow, what a contribution to the community, many thanks!!! Downloaded it, works super nice so far. The “Import charakter” only imports .json files, is this right? Thanks again, this is really a great add-on. Wow! Really awesome contribution. Just tested it and love it so far! Thanks and keep it up! Manuel, this is amazing, thank you so much! character.The percentage slider would allow people to modify how similar the character will be to that type of animal. I think the aliens they make in sci fi movies are a mixture of human and animal.